Driving in icy conditions – low-tech preferred! – HubNut – celebrating the average! Driving in icy conditions – low-tech preferred! As I’m sure you’ve noticed, there is a cold snap occurring at present. I’ve been having a jolly old time comparing modern technology with old, so thought I’d report on some findings. First, the items of comparison. One is my Citroen 2CV. It has absolutely no assistance for anything, not even the brakes. 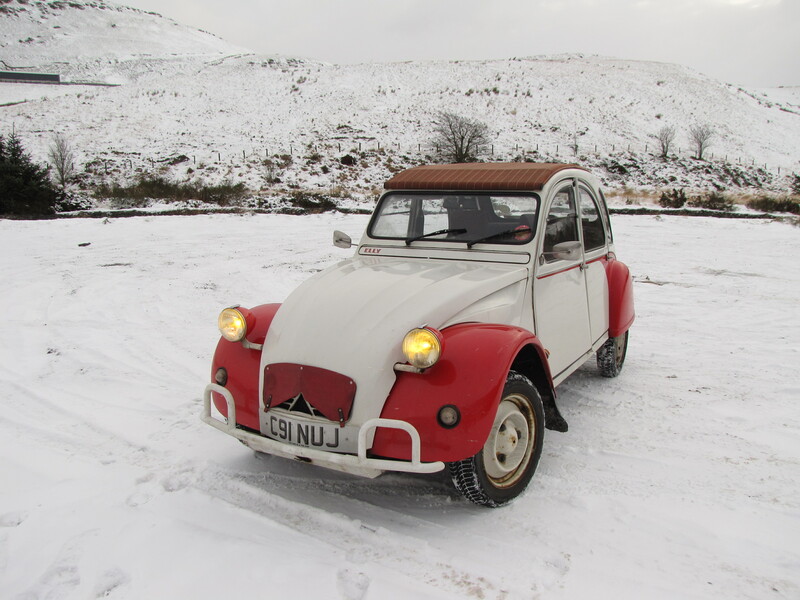 It has Toyo 135 summer tyres, as while you can get snow tyres for a 2CV, it doesn’t seem that you can currently get anything with a true winter compound. Second is my Citroen XM. This has powerful hydraulic assistance for steering and brakes. It wears Continental ContiWinterContact TS850 winter tyres. It has to be said that both are managing to get me around, even on untreated, narrow country lanes with no problems. Sure, conditions still need to be respected. There’s an awful lot of sheet ice around and you won’t find grip on that with any tyres that lacks studs. To be honest, things haven’t been too bad so far, though traction and braking are both affected at times. I largely manage to avoid problems by using my brain – stay off the brakes as much as possible and if the car begins to skid, don’t panic. The ice patches are generally quite small, and safety can be assured by simply doing nothing at all. I was fretting when following a car on the snowy A44 the other day, as the driver appeared to keep hitting the brakes every time they got worried about grip! Not a good idea. But, I’m noticing that I’m far more comfortable driving the 2CV in these conditions than the XM. That’s because I can really feel the grip levels. Hit black ice in the 2CV and you really can feel the effect it has on the steering wheel, even when travelling in a straight line. This saved me a few winters ago, again on the A44. I felt a lack of grip as we climbed up a hill. There wasn’t anything as dramatic as wheelspin, just a very slight tug on the wheel to tell me that only one wheel had grip. I slowed down as a result. We went around a bend and the back end stepped out of line. I maintained throttle position and steered into it and gathered it up. The Ford Focus that was charging up behind me, oblivious to the diminished grip, got a REAL tank slapper on! Fortunately, he’d had some warning by watching me and fair play, the driver managed to gather it up. He didn’t seem as keen to go quickly after that! I’m not sure I’d have that level of knowledge in the XM. Power steering robs feel and I find I’m much more on edge if I don’t trust grip levels. It is by far the clearest indication of how different modern cars have become. You’re so insulated against the outside world that you might not realise that you’re in trouble until it’s too late. It’s a similar story with off-roaders. I prefer my Land Rovers with mechanical diff locks and driver sympathy. The problem with relying on technology is that it isn’t always able to cope, and drivers then don’t have enough skills to deal with a problem. This video is a perfect demonstration. Stay tuned for further reports. I’m urgently trying to get the XM rear wheelarches painted as significant snow is forecast later today. This may be a very good opportunity to test XM on winter tyres versus the 2CV. I have to say my wee derv polo is good in these conditions-heavy load over the driving wheels plus 175/65/13s do help. Unfortunately the power steering is geared far too light so understanding grip levels is difficult. Appropriate level of Caution helps-as does planning ahead and avoiding braking.